The Comprehensive Case Framework aims to provide early-career consultants and business-thinkers with a practical template for diagramming and visualising organisational problems quickly and easily. Why might it be useful to me? If diagramming is a weak-point in your case interview skills arsenal, or if you would just like to be able to speedily gain broad insights into an organisation with a simple framework, look no further. A lot of business school alumni or hopefuls know that there are many people who aspire to become management consultants. Whilst this career isn’t for everyone, the tools that consultants use for structured thinking and problem solving are very useful to anyone that has a problem to solve but doesn’t know where to start. To break into the management consulting world, one usually has to go through multiple “case interviews” where a candidate is given a business problem to solve on the spot during an interview. This process serves to allow the interviewer to see how you solve problems live and under pressure. In almost all cases, they are looking to see how structured you are in your thinking and presentation, and the best way to demonstrate this is through top-down diagramming. Being an engineer and project manager, structured thinking is something that was drummed into my peers and I at a young age, and the concept of the famed “McKinsey MECE framework” is quite familiar to us – effectively a repurposed Work Breakdown Structure (WBS) with The Scientific Method mixed in. During my time at business school however, I noticed that a lot of my non-technical peers, despite having a good feeling as to how to go about solving a particular business case, struggled when it came to diagramming one. Complaints such as “The case started out as a sales case, then became a productivity one. I knew how to talk about it, I just couldn’t put it all together neatly and coherently on paper and things got messy” were common. The Comprehensive Case Framework was developed to be a one-size-fits-all framework that would allow you to diagram any case you can imagine. The framework will be demonstrated through case examples from some of the world’s best business-school consulting clubs, and will be explained with weekly lessons addressing a different part of the framework. I will guide the readers through the comprehensive general framework using a top-down approach. Each box shown on the highest level framework stands alone as an independent framework – ready to be neatly drawn on no matter how things evolve during a case interview – and these stand-alone frameworks will be discussed one-by-one. The school of thought is quite comprehensive, and once you have understood the fundamentals behind the framework, you may never need to physically refer to it again. In fact, that is my aim! The first thing that will stand out to a reader is that profit is the great unifier of all issues. Whilst it is not always this black and white, we will discuss “The Profit Motive” during the first lesson, and see how it is also applicable to non-profits and government organisations. 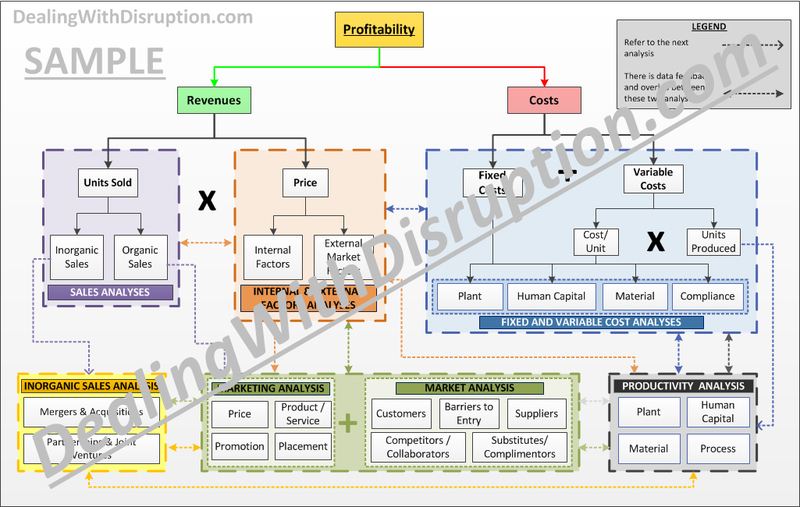 From profit, we move down a tier to the main profit drivers, revenues and costs. Moving down an additional tier is where the interdependent drivers-of-the-drivers come into play. The interactions between these sub-drivers is illustrated on the framework, but will be explained in much more detail over the coming posts.